But just knowing that isn't enough to be one of the first to get your hands on one. You'll need to make sure you ready and practice, practice, practice. We'll go over some quick tips below on how to secure a new iPhone X from Apple directly when preorders first open up. 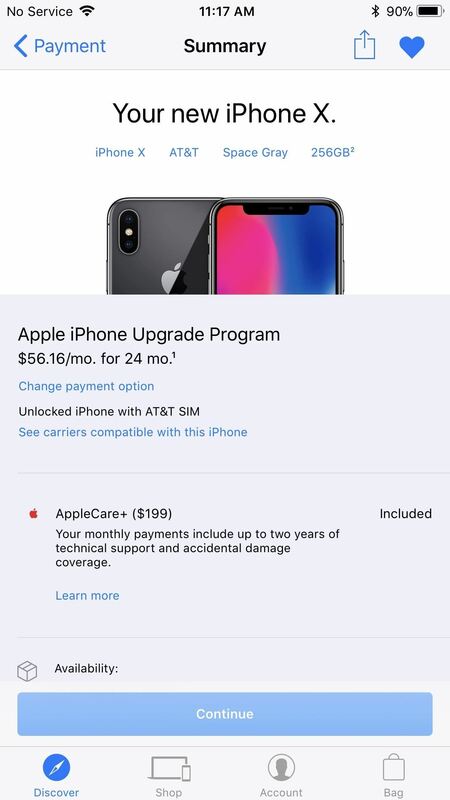 Obviously, if you plan on getting or upgrading to a new iPhone from your carrier, you'll want to go that route instead. Some of the tips below will still be helpful for you, though, so check them out and get ready for preordering time. 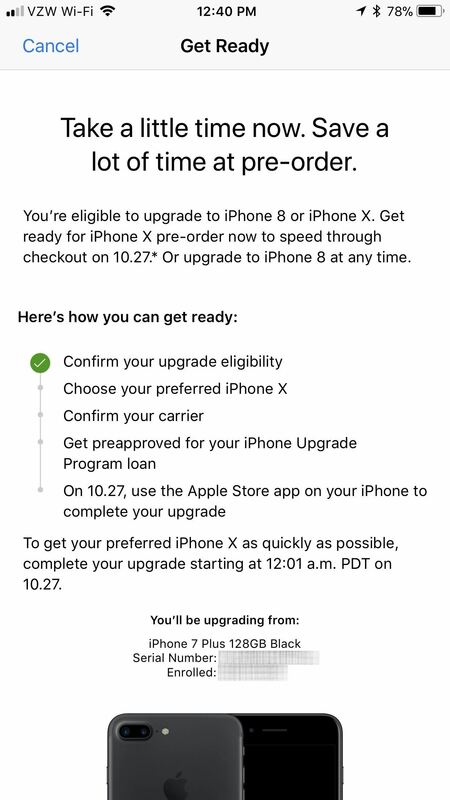 If you're currently on the iPhone Upgrade Program (IUP), make sure to check if you're even eligible to upgrade to a new iPhone X. Been on the plan for over 12 months already? Then you should be good to start checking out the other tips below. If it's been at least 6 months, and you've made at least 12 months worth of payments, you're also good to go. 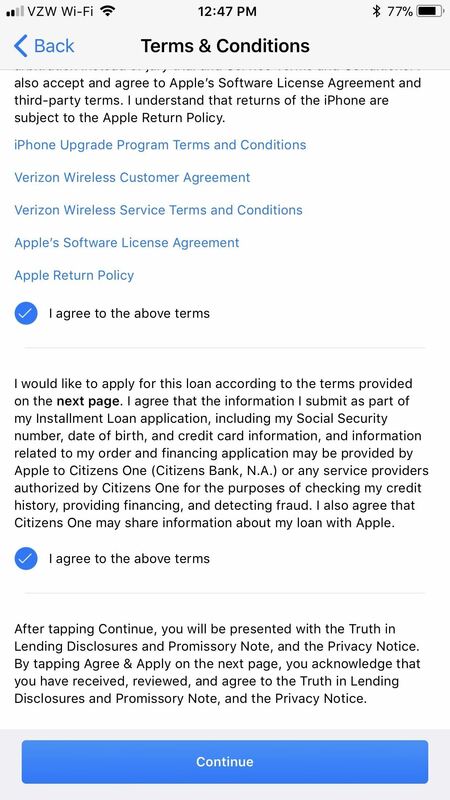 To make things easy, you can check and see if you're eligible to upgrade using Apple's online tool, or just check out Tip 3 below if you know you want to preorder the iPhone X. This tip might come as a bit of a surprise, but the Apple Store app is a surprisingly reliable way to make purchases and preorders through Apple. Buyers even report that the app is faster and most trustworthy than Apple's website for preordering during the heavy traffic. If you've never used the app before, just think of it like the App Store but for hardware, like iPhones, iPads, etc. 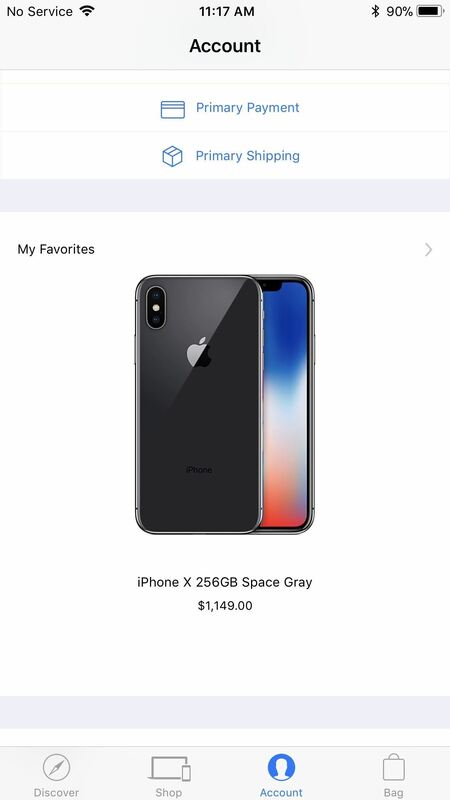 It's just a convenient way for customers to purchase products on mobile — without having to risk using the official Apple site. 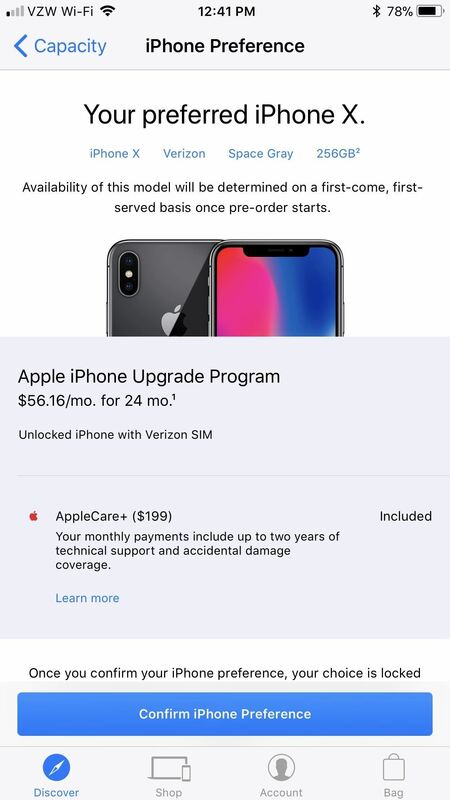 If you're already on the iPhone Upgrade Program, you have the best chance of securing a new iPhone X because you can get preapproved for the iPhone X you want using the Apple Store app. This means come preorder time, all you have to do is complete the upgrade via the app. If you're not already on the iPhone Upgrade Program, make sure to check out the other tips below. To start, open up the app and at the top of the page, you'll see a notification to Get a head start on your upgrade. Tap on "Start now" to begin. If you don't see this message, tap on the iPhone X image and it'll hopefully appear on the next screen at the top. 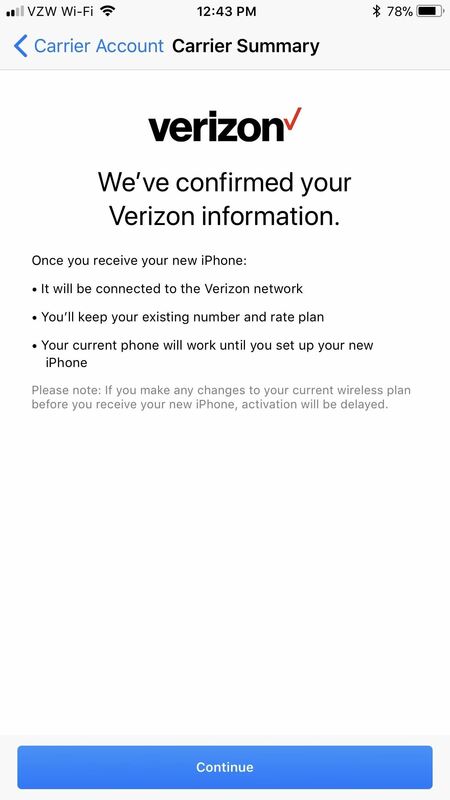 It will automatically confirm your eligibility to upgrade, and if you're good there, all you have to do is go through the on-screen prompts to save everything. 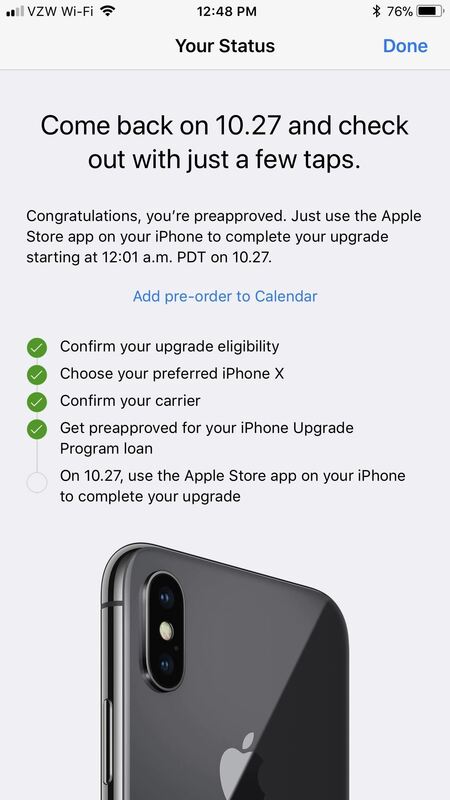 According to the app, you can get preapproved for the iPhone X with the iPhone Upgrade Program until 4 p.m. PDT on Thursday, Oct. 26, so it's better to do this sooner than later, just in case you forget. Also, once you confirm the color and capacity you want, you won't be able to make any changes until preorders open up, in which case you can make changes during checkout. However, that means you will waste precious time and might not secure an iPhone X in a timely manner. So make sure before you commit. 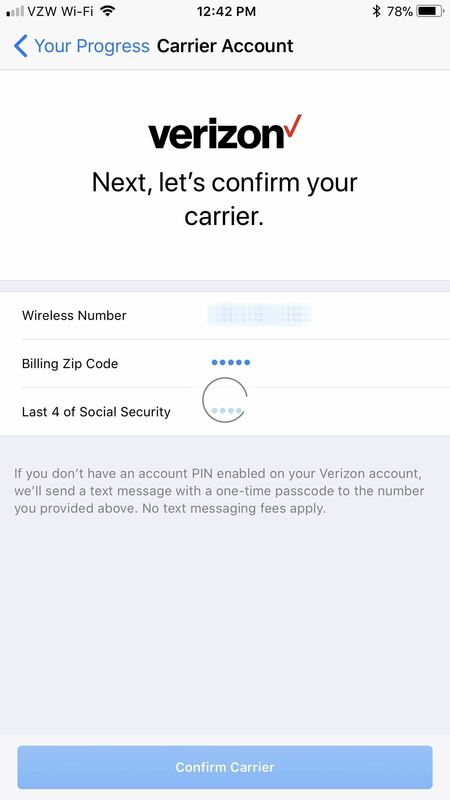 When in the carrier selection section, you may need a PIN to continue. Also, if you get an error about "problems connecting to the server," just tap "OK" and keep trying. If you're in the middle of a plan change, you might not be able to proceed until the details of your plan have concluded with your carrier. After that, you'll have to go through the process of giving up your social security number and confirming your billing address, shipping address, payment method, birthdate, and total income amount. If everything goes well, you'll need to accept the terms and conditions and the installment agreement. Then you're all set for game day. 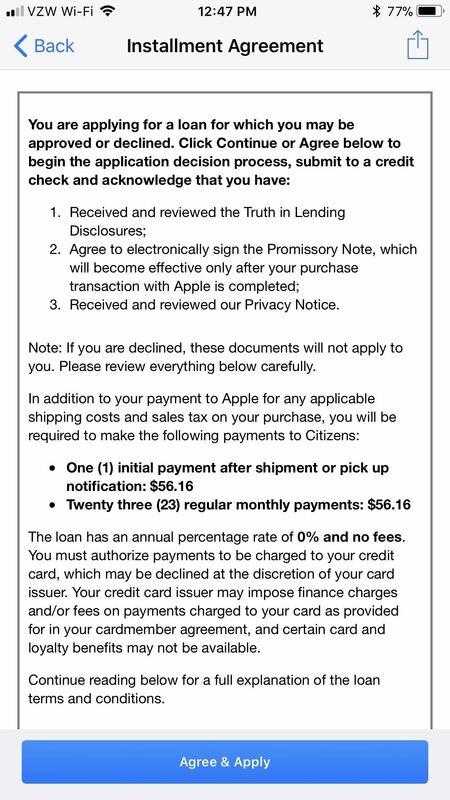 If you can't use the tip above because you're not on the iPhone Upgrade Program, the last thing you want on preorder day is to suddenly remember you have an old credit card attached to your Apple ID. By the time you've entered a new card into your account, those new iPhones may be long-gone. Make sure that doesn't happen by double-checking your payment information. Like, right now. 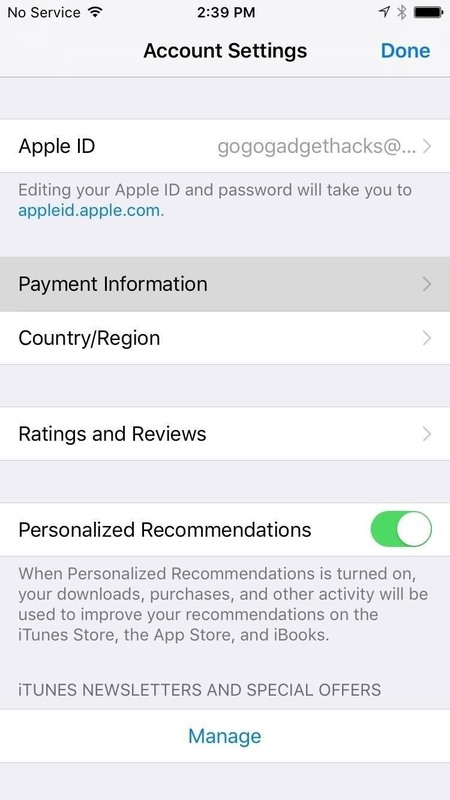 Just head to "Account" if using the Apple Store app. 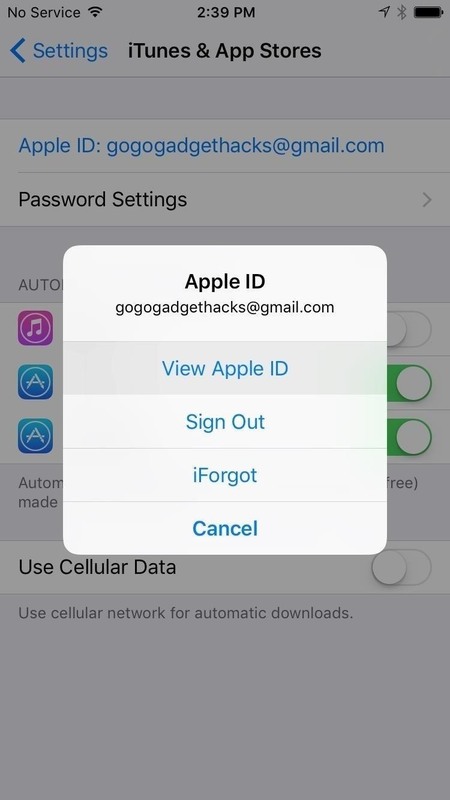 Alternatively, go to the iTunes & App Store menu in your iPhone's settings, tap your Apple ID, then choose "View Apple ID." Next, tap "Payment Information," then carefully review what you have entered already, or enter your relevant information. Updating through the the Settings menu in iOS. Aside from making sure you have the right payment information saved, you'll want to make sure you update your primary shipping address too, especially if you've recently moved. Just open up the Apple Store app, tap on "Account," then choose "Primary Shipping," and sign in. Make any changes necessary and "Save." In the App Store app, you can save the iPhone X as a favorite. When it's finally opened for preorders, you can just tap on your favorite and save some time trying to configure your model. To do so, being selecting the iPhone X version you want and continue checking out. When you get to the Summary screen, just tap the heart icon to save as a favorite. You can access "My Favorites" from the "Account" tab. You know how you get to Carnegie Hall, don't you? 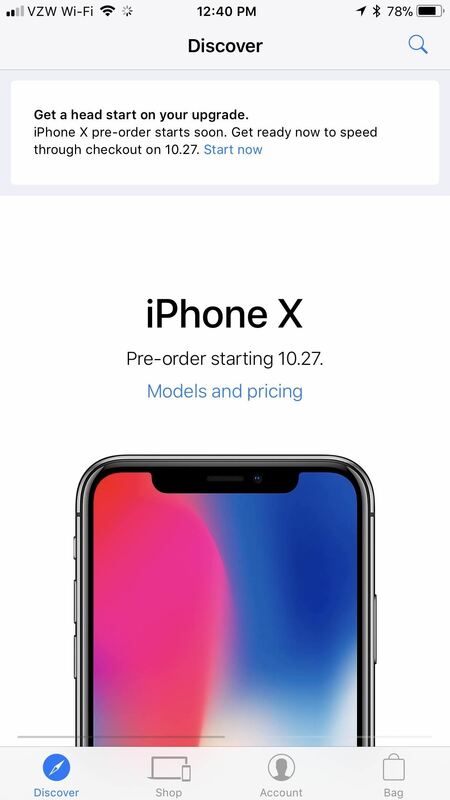 Practicing ordering on the Apple Store app is a great way to make sure you know what you're doing when you do preorder your iPhone. Just go through the steps to ordering a product on the app, and stop before payment is required. Unless, you know, you want to buy something. What happens if, for some reason, your iPhone freezes or shuts down right before you can preorder the new iPhone? You won't need to panic because you'll have set up a preorder on multiple devices. That way, if one device actually crashes, you can switch to one of your other devices to complete the preorder. Another good tip, if possible for you, is to keep each of these devices connected to a different internet connection. That way, you won't slow down your internet with multiple devices all using the same network. 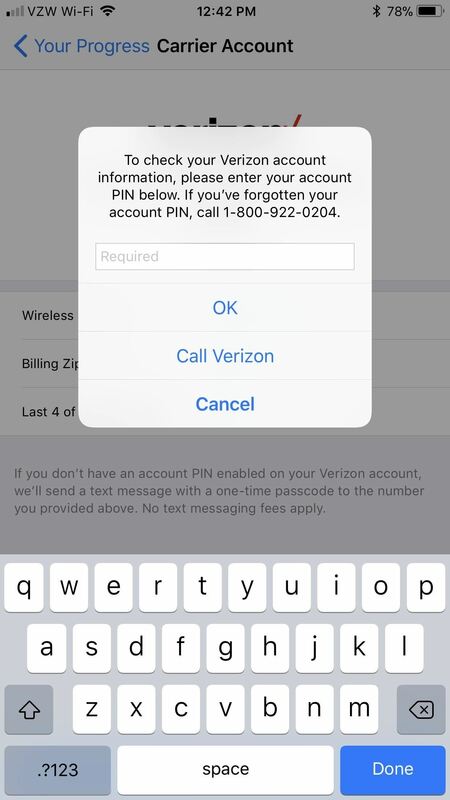 If you connect your iPhone to cellular, you can at least have two separate networks to work with. This tip's easy — the fewer apps you run at once, the less stress you put on your RAM. If you don't run any other apps, you free up system resources for the Apple Store app to process your purchase(s). Not a bad tradeoff. To kill any running apps, double click the home button, then swipe up on all apps other than the Apple Store app. It's that simple. If you want to get your hands a bit dirty, you can also purge the RAM on your iPhone. Follow the instructions in the link below to find out how. It might sound simple, but setting yourself a reminder can be the difference between an iPhone X and an iPhone 8 or 8 Plus. Just set yourself a reminder for that 12:01 a.m. PDT preorder time, and you can rest easy knowing you won't forget anything. If you used Tip 3 above for the iPhone Upgrade Program, you can just tap on "Add pre-order to Calendar" after you've been preapproved for your loan.